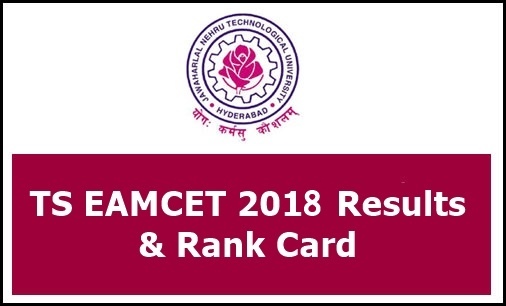 TS Eamcet Results 2018: Telangana EAMCET Results & Telangana eamcet rank card released on 19th May at Eenadu, manabadi.com, eamcet.tsche.ac.in, schools9.com. Candidates check their results, rank card and final answer keys, Qualifying Pass Marks from here. Telangana State Eamcet exam is conducted by Jawaharlal Nehru Technological University Hyderabad on behalf of TSCHE. Each and every student who desires to get admission in Jawaharlal Nehru Technological University Hyderabad affiliated colleges. Telangana EAMCET Examination was successfully organised and students are waiting for TS Eamcet results 2018 with ranks. Telangana EAMCET 2018 Results: TS Eamcet exams were conducted in a strictly organised manner by authorities. Students from both government and private colleges had appeared in large number for Eamcet examination to get admission for B.E/B. Tech, architecture. Students are looking forward for the TS Eamcet 2018 Engineering and medical Result. To check your results, student should visit the official website of TS Eamcet. Here we provide you the official TS Eamcet website eamcet.tsche.ac.in. You can check your marks and qualified details in this site once when the results are released. After checking your result you can under go mock counselling. You can download your ts eamcet rank card from the official website itself. Exams was conducted from 2nd may to 7th may 2018 for agriculture/medical and engineering students in respective dates. EAMCET Ranking: The candidates who have secured qualifying marks in TS EAMCET-2018 and candidates belonging to the category of Scheduled Caste and Schedule Tribe, for whom qualifying marks have not been prescribed, shall be assigned ranking in the order of merit on the basis of combined score obtained by giving 75% weightage to the marks secured in TS EAMCET-2018 and 25% weightage to the marks secured in the relevant group subjects namely Mathematics or Biology, Physics, Chemistry of the qualifying examination. The students who have written the Eamcet exams can download TS Eamcet rank card 2018 in the official website. QUALIFYING MARKS FOR TS EAMCET 2018: The qualifying percentage of marks for the TS EAMCET-2018 is 25% of the maximum marks considered for ranking. However, for candidates belonging to Scheduled Caste and Scheduled Tribe, no minimum qualifying mark is prescribed. But their admission will be limited to the extent of seats reserved for such categories (vide G.O.Ms. No. 179, LEN&TE, dated 16.06.1986). Telangana Eamcet 2018 Results Release Date? Telangana (TS) EAMCET Results and Rank Card 2018 Released. Click on the link and find the results hyperlink. Your result will be displayed. Follow the above steps to check your ts eamcet 2018 results and download your rank card. For more official information visit our website daily. i got 48 marks in TSEAMCET, but failed in one subject now passsed in instant examination I visited JNTU kukatpally they said that ranking will be linked automatically to all who have passed in instant exam on 12-06-2018 but not updated till date . someone please help . I got 48 marks in eamcet belongs to bcd category I wrote supplementary and I have passed. sir i failed in inter in (sanskrit) but i passed in supply i got 46 marks in EAMCET but i din't got rank in eamcet rank card now how can i do cousiling sir plz leave me a reply for this msg sir iam requesting you………. where to find results name wise ? Sir, I got 15652 rank in TSEAMCET and I am from AP state…can I get top colleges in hyderabad..? According to key sheet I got 51 marks but rank card showing 48 only how ?? Click on this link and fill respective fields and then click on submit button.